I hope everyone is having a nice spring! If you’ve been putting off some of your training goals until the weather improved, it’s time! Get out there! I wanted to give you an update on Peck’s training. He’s almost 2 years old now. 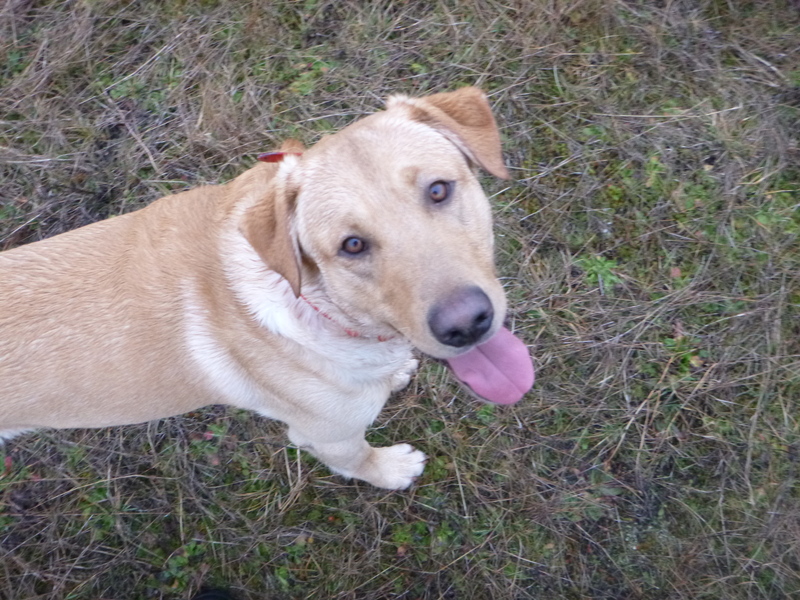 Each day on our off lead walk I see him getting more and more bold and adventurous. Where he used to maintain about 20 to 30 yards between us, he now ventures far beyond normal gun range. His excursions always bring him back to me, but his range is getting waaaaay beyond what we want in the field this fall. So, now I am at a crossroads. 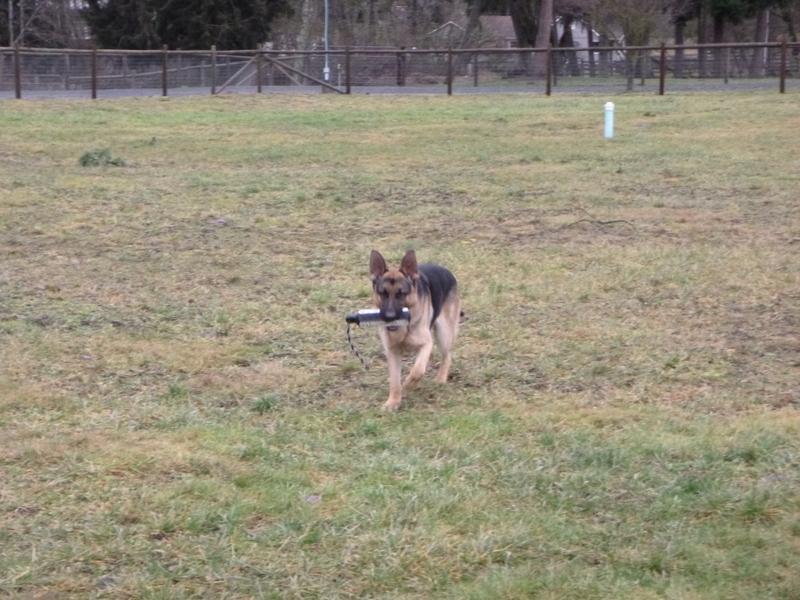 I can either use control via voice/handsignals (with e-collar enforcement if necessary) OR I can try to use my influence to teach him to work closer. If you know me, you already know that I’m going to choose the influence method. I want Peck to use every available braincell to find birds. I don’t want him worrying about what I want and whether or not I’m going to shout a command or nick him with the e-collar. I want his entire being concentrated on locating birds. This is a dynamic that I think about a lot: Control vs. Influence. I think sometimes we humans allow our egos to take over and push a lot of control on our dogs just to make us feel like we are in control of something. It’s not that control is such a bad thing. We NEED control in many situations in order to keep our dogs safe, but often we see this need for control creeping into other areas where it isn’t nearly as important and the act of controlling the dog seems more like an ego-booster for the handler than a necessity for the dog’s well-being. Back to the field: How am I going to keep Peck from enormous circles that take him far out of range? Much of this can be accomplished with the “Big Rubber Band” technique that I wrote about in an earlier post. You can check that out here if you’re interested. Another variation on the “big rubber band” is to wait until he is halfway into the next zipcode and slip into a hiding spot where he will have to really look hard to find me. I have to be careful with this trick though because if used too much it can lead to Peck losing trust in me. Carrying a retrieving bumper in my pocket will keep him close too, because he wants to retrieve and that keeps him close to any potential retrieving action. 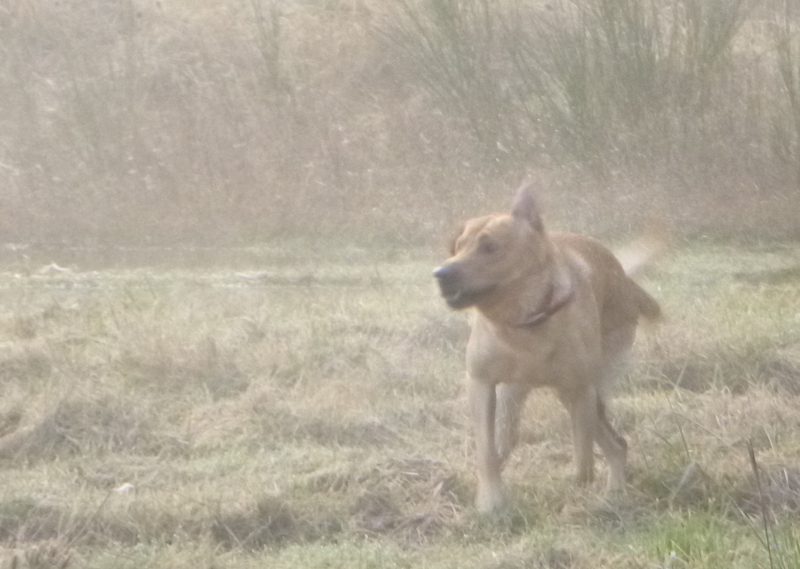 the downside of this approach is that he eventually loses his focus on finding birds because he’s such a retrieve-o-maniac. Like other techniques, it can only be used in small doses. The same be said of the dummy launcher. It keeps the dogs extra attentive to me because they’re waiting for me to shoot a bumper rather than searching for birds. Planting live birds for them to find is another trick we use. It’s important to pay attention to wind direction when planting the bird so the dog doesn’t pick up the scent right away and run straight to the planted bird. The set up and approach should be such that the dog always finds the bird while he is working well within range. 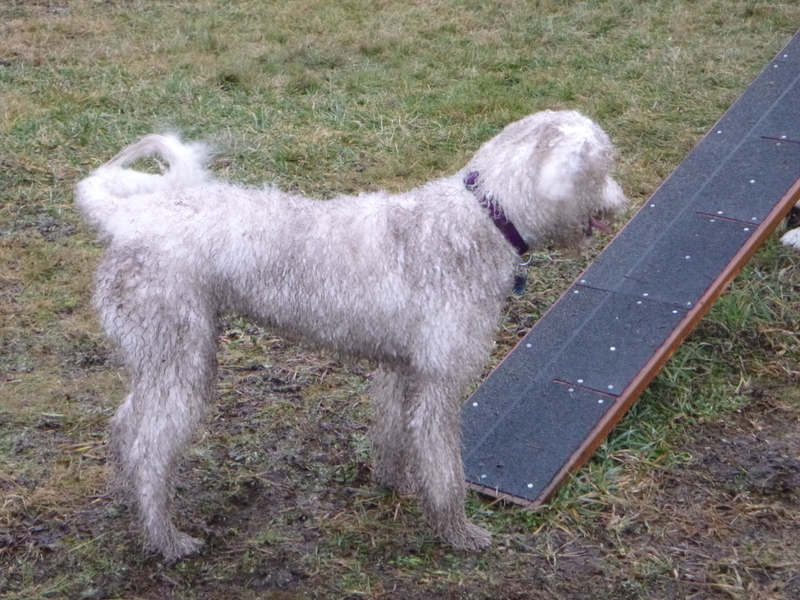 All these little tricks (and others) are good ways to influence the dog to work within range. There are plenty of methods to achieve this with control, but I think that by exercising too much control we lose something important. We can keep a dog in range with e-collars and check cords and loud voice corrections, but none of these are things we really want to use while actually hunting. Most of you have probably heard the guy who can’t go more than ten steps in the hunting field without screaming at his dog. I don’t know about you, but I try to put as much distance as possible between myself and that guy. The good news for me and Peck is that we have until September to get all this worked out. That will be plenty of time. With enough time and patience and a good pair of boots I think we can accomplish almost anything! Slack Leads to you all! We arrived at our Top Secret Training Location just after dawn. 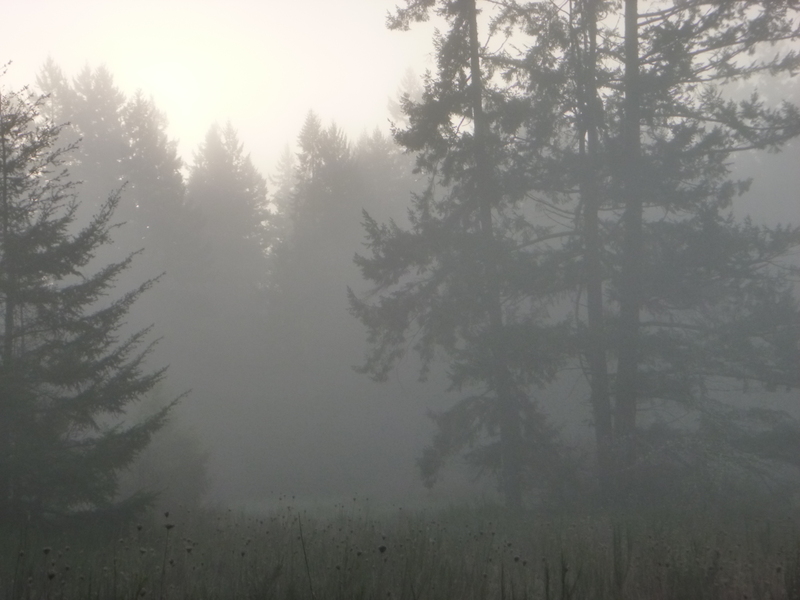 It was pretty foggy this morning! We were greeted by a coyote that was barking his fool head off at us. 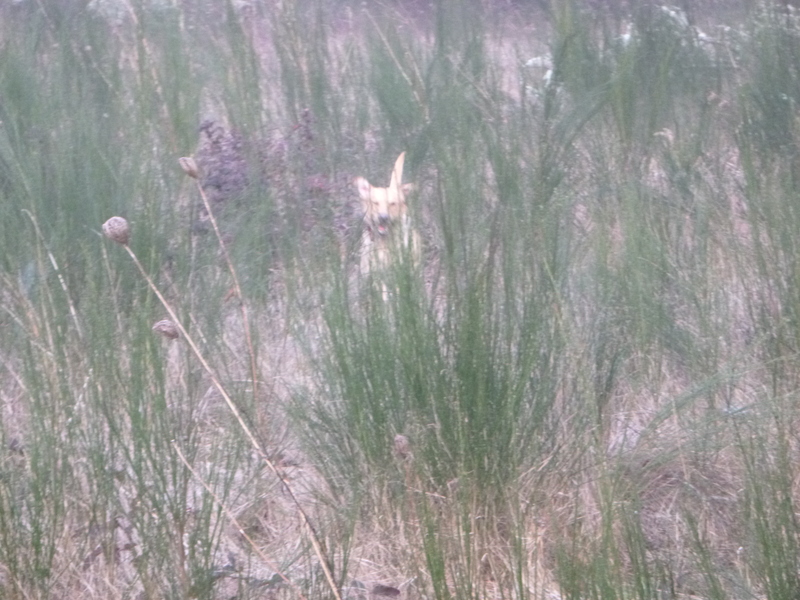 He was throwing rapid fire challenge barks and moving back and forth about 40 yards in front of us. I made the dogs heel and we walked directly toward him. 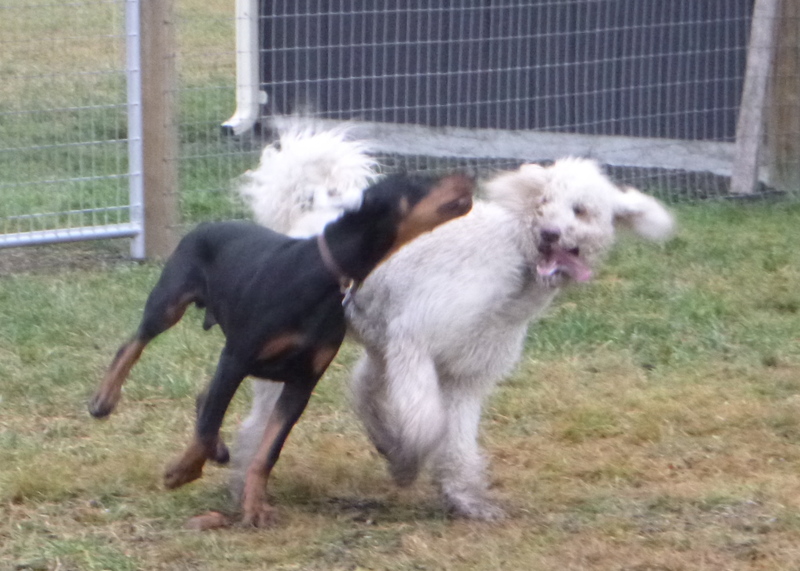 He relinquished the territory, but continued to challenge-bark as he backed away. We pushed him a little farther back away from our position, then changed course and headed across the wind so we would not be so easily detected. I was never worried about him. I’m not the least bit afraid of coyotes. I do have some concern that Peck might get too friendly with them, so I am careful when I know they are stirring in the vicinity. Sorry I didn’t get a picture of the yodel-dog, but I was too busy keeping my animals under watch to think about pulling the camera out of my pocket. Oh well, I’m sure you’ve all seen a coyote before. 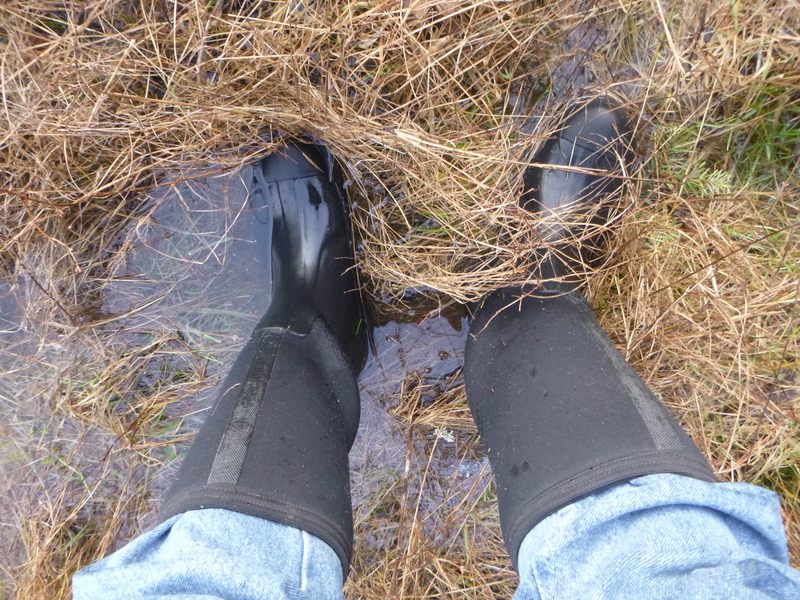 We spent the rest of the morning exploring a swampy area where I knew Peck would be too busy to think much about the coyote. The strategy appeared to work. Here’s a shot of my most important dog training equipment. Everyone who has a dog should have at least one pair of these! My wife, who is the family’s self-appointed footwear connoisseur, can tell you that these things ROCK. Warm and dry all the time! 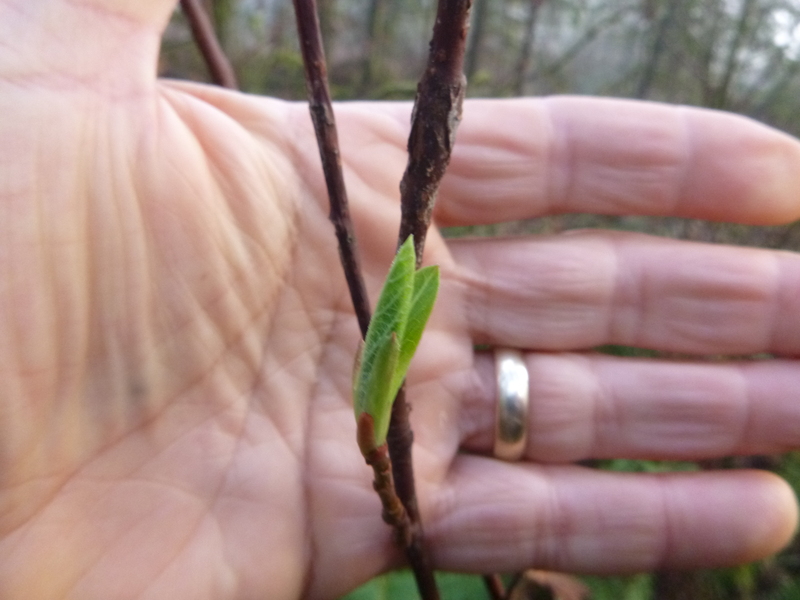 Besides the interaction with the coyote we also found another sure sign that spring is rapidly approaching. Once upon a time in a career far far away, I was sitting in an auditorium at a sales seminar, listening to the speaker explain that every purchasing decision is made on the basis of emotions. The two most common emotions that drive people’s purchasing decisions are fear and greed. He claimed that nearly every purchase we make is driven by one or both of these emotions. He asked the audience if anyone could remember making a purchase that was not driven by emotions. Someone in the audience raised their hand and he asked them what their “emotion free” purchase was. The guy stood up so everyone could see him and loudly exclaimed, “toilet paper!” This was met with a roar of laughter from the audience. When the laughter had died down the speaker asked the poor guy why he was buying toilet paper. “Because we were almost out”, he said sheepishly. “And how did you feel about that?” asked the speaker. There was a murmur of agreement from the audience accompanied by nodding and a giggle or two. Every one of us in the room could relate to the mild fear that drove that purchasing decision. If you want to get kinda philosophical about this, you can think for a minute about what an enormous role fear plays in each of our lives. What kind of person would you be if there was no fear? What would motivate your actions in the absence of this emotion? What would our existence be like if our actions did not have consequences? More importantly, what the heck does this have to do with dogs? Everything. I don’t know about you, but I have to constantly remind myself that each and every behavior, whether it is dog behavior or human behavior, has a consequence. Think about it for a minute… It bears repeating doesn’t it? Each and every behavior has a consequence. Whether it’s your kid being rude, your spouse being extra kind or your dog jumping on you with muddy paws, each of those behaviors has a consequence. The likelihood that the behavior will reoccur is directly affected by the consequence. Consequences are the “reinforcers” we are always talking about! If you want to know why Fido jumps on you, look for the consequence. Why is your daughter so incredibly rude sometimes? What is the consequence! If your wife is especially kind and sweet to you on Thursday, what is the consequence? By identifying the consequences of a given behavior we are focusing on what reinforces that behavior. When we have a firm grasp on what the reinforcers are, we are in a much better position to modify the behavior. If we have control over the reinforcers (we don’t always have this) we are able to design a program to modify, increase, or eliminate the behavior. In the case of the dog that jumps on you, what are the consequences? Physical interaction is the first one that comes to mind. The dog gets to “play” with you even if you don’t think it’s fun, it’s still play to him because he initiates the activity and you respond in a way that satisfies his need for physical interaction with you. Game ON! What if the consequence was the immediate denial of attention? The important part of that last sentence was the word, “immediate”. 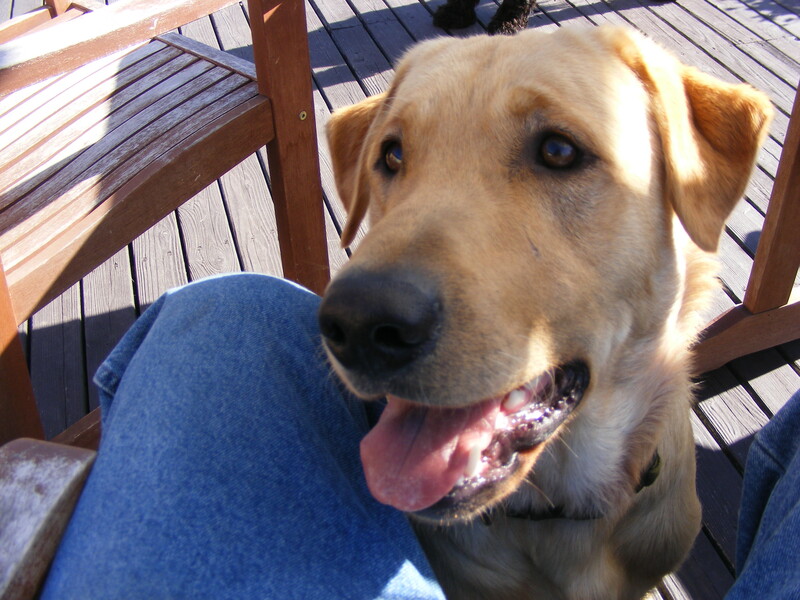 The strategy only works if the dog understands the removal of attention as a direct consequence of the jumping behavior. I chose this particular behavior/consequence as an example because I’m using it right now on a dog that is boarding here at the kennel. He is a world class jumper who absolutely cannot resist jumping and putting his paws on me. In order for him to understand that this has a negative consequence for him, I wait until he has stopped jumping before I open his kennel door to let him out. It takes him a minute to settle down, but he gets better at it every time I let him out for his exercise. Dogs here at MCK get out for exercise at least 4 times every day, so I use this opportunity even if they are not here specifically for training. Similarly, I refuse to pet, touch, or make any contact with the dog unless he has all four paws on the ground. Keep in mind, this dog is not here for training so I have not had any focused sessions with him, but we are seeing a huge improvement in the jumping behavior already after a week here at the kennel. When he goes home, his humans are likely to continue with their old ways and he will begin to jump on people again, but I can’t do anything about that. Why not? Because I have no control over the consequences of these people’s behavior! Look for the consequence to identify the reinforcer. Determine if you have any control over the consequence/reinforcer. Modify the consequence to modify the behavior. I’m still feeling kinda puny after having surgery 3 weeks ago. That explains my absence from the blog. I’m very grateful for my friends and family who have helped exercise my critters while I’ve been laid up. I’m back to walking with my dogs every morning now, even if the walks are much shorter than they’re used to. I’ve had to take some of my own advice and multiply my efforts in order to provide Peck & Kaia with enough exercise to keep them from going bonkers. If you’re reading this blog, you probably already know how important exercise is for dogs. Not the “throw ’em in the backyard and let ’em play” kind of exercise either. Nope, I’m talking about exercise that involves interaction with you. Unless you happen to be a young, fit, well trained athlete, you probably don’t have enough energy to go mile for mile with my dogs. I know I can’t! So I have to find ways to multiply my effort. This is especially important right now because I don’t have as much strength or energy as usual but my dogs are just as full of vinegar as they always are. 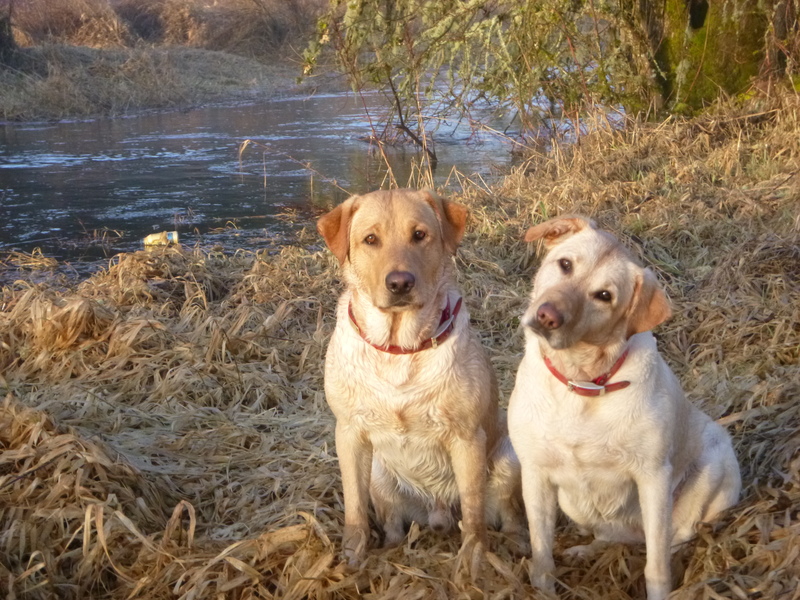 Since my dogs are labs, multiplying my effort by using retrieving is a complete no-brainer. I won’t go into any of the finer points of retriever training here because we’re talking about exercise. Tennis balls can be inappropriate toys for some trained retrievers but for others, they are a great way to burn up excess energy without exhausting the trainer. The Chuk-It toy works well for this because it enables you to throw the ball farther than you normally could. Dummy launchers are another method of flinging a retrieving bumper 50 or 60 yards with minimal effort. These gizmos use a .22 caliber blank to throw a retrieving bumper. 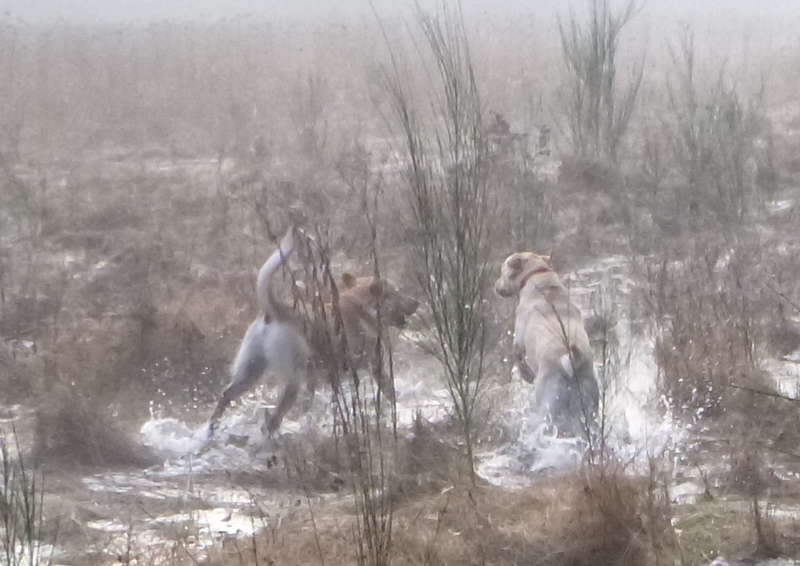 Once again, not always appropriate for a trained retriever, but a great way to multiply your effort. Multiplying your effort doesn’t always mean using a gizmo or piece of equipment. Just throwing a bumper is a great way to get your dog to burn energy with a minimum of effort on your part. 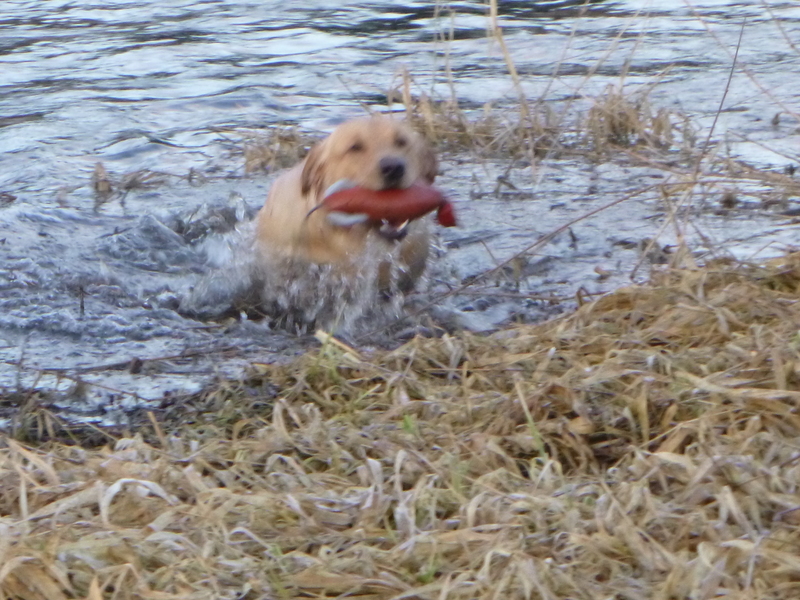 This works especially well when the retrieve includes swimming. 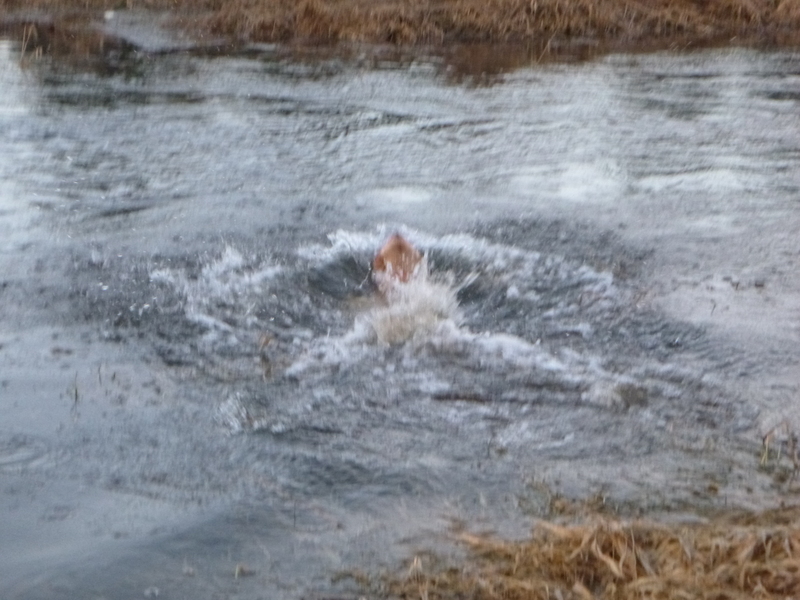 If you have a smooth flowing, safe creek for the dog to cross it’s even better. This is what we did this morning. 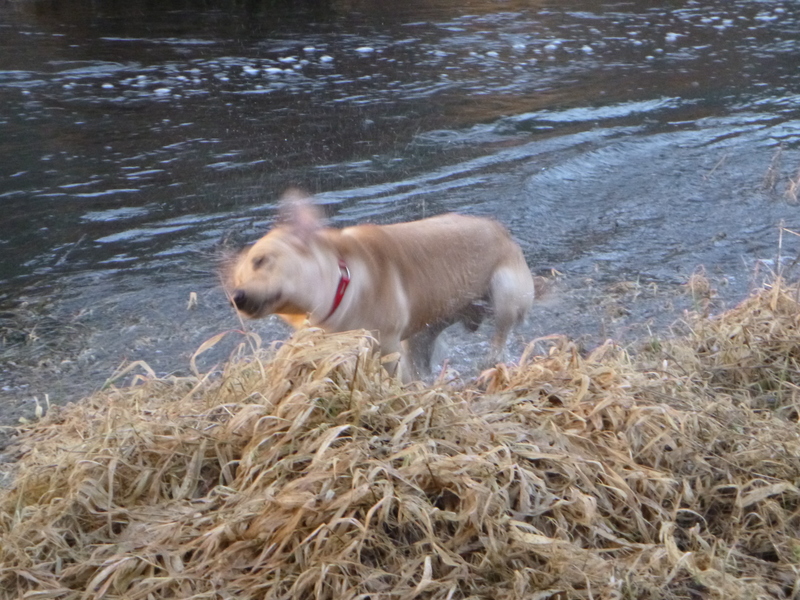 This is great exercise because it requires enormous effort for the dogs to cross the current. They have to use all their senses and drive to mark, track and find the bumper. 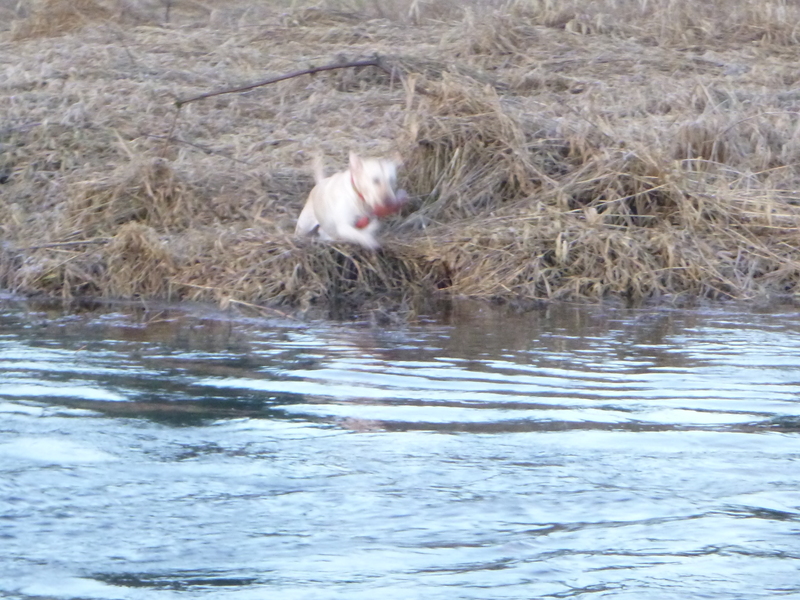 I get to keep all the usual retrieving rules in place so we’re not backsliding on our retriever training. 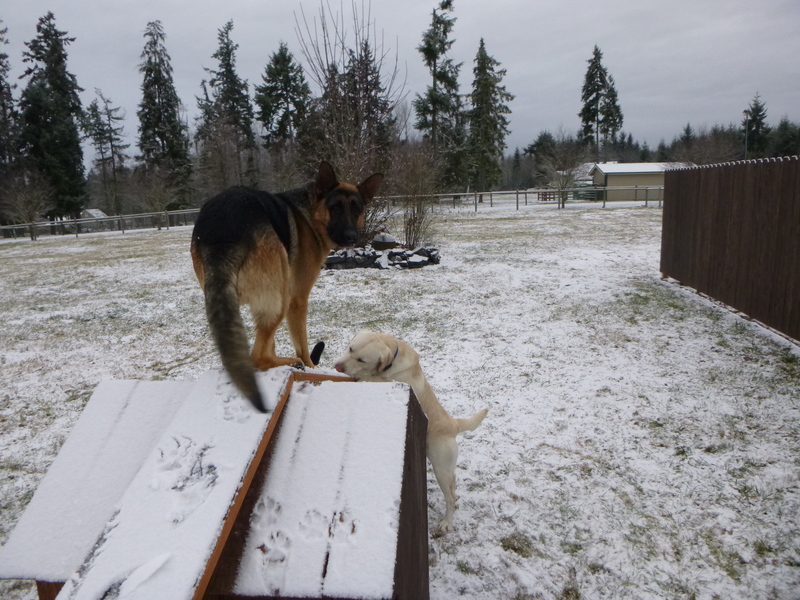 Oh… and did I mention that the dogs absolutely LOVE it? Multiplying my effort is a very familiar concept to me. I use it a lot. I try to remember little things like taking the path back to the truck that doesn’t include any road or well worn trail. It doesn’t cost me very many calories, but the dogs are much more excited and cover exponentially more ground than they would if we were just plodding down a trail. Any time you can introduce your dog to a new patch of habitat to explore, you are multiplying your effort. The novelty of the situation forces your dog to fully engage his senses. A fully engaged critter burns more excess energy than one that is simply walking on lead with his human companion. Some times it’s enough just to walk the same area, but take the route in reverse. So, those of you who aren’t marathon runners, what do you do to multiply your effort so that your dog gets the interactive exercise he needs? Please share your tips and ideas. I can always use more effort multipliers! At approximately 2:00 PM on Saturday, Diesel left Muck Creek Kennels to go to his Forever Home. His new guardians are a nice, local couple who have loads of time to spend with our rambunctious boy. I’m very happy for Diesel because now he will have a home inside their house and inside their hearts. He’ll have a full-time human all to himself and he won’t have to share his new humans with any other animals. 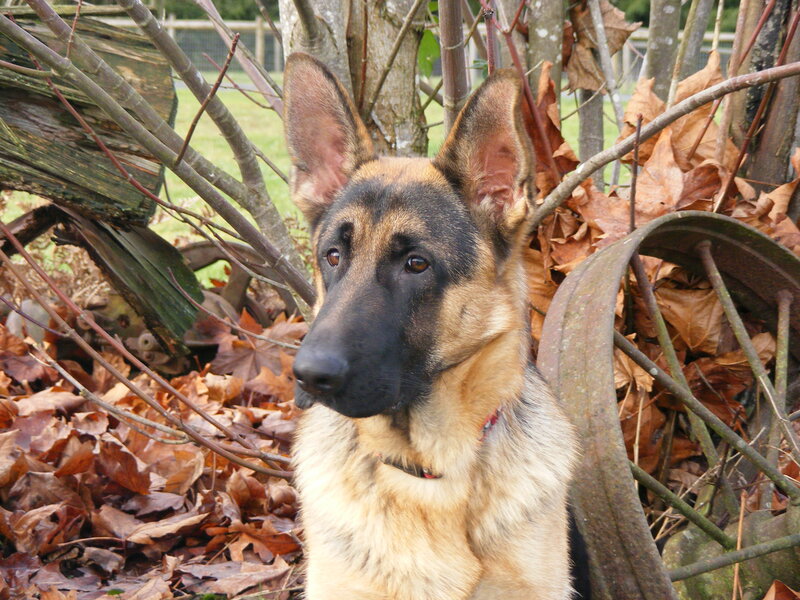 His new humans have experience with the German Shepherd breed and they understand that Diesel needs lots of exercise and mental stimulation in order to thrive in his new surroundings. To be totally honest, I was a little sad to see him go. My eyes got a bit hot as I watched him looking at me from the back of their SUV as it went down the driveway and out the gate. 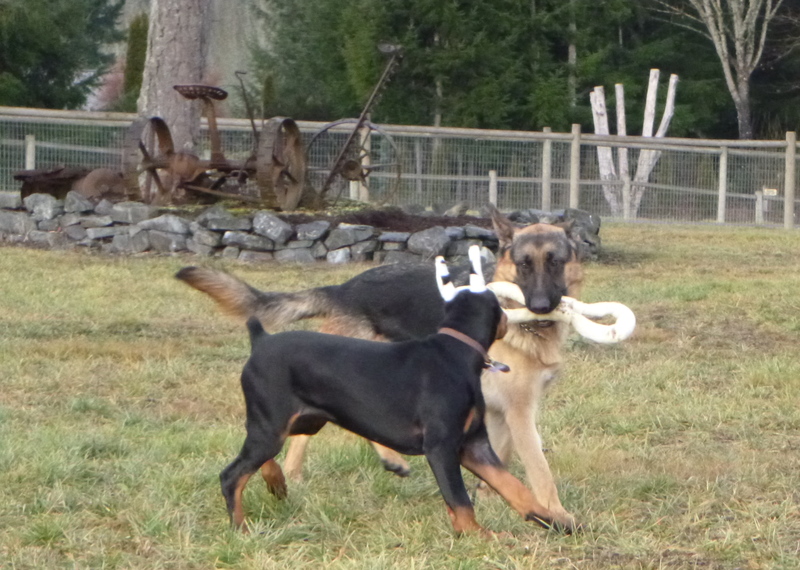 Diesel and I had grown very fond of each other over the last 2-1/2 months that he has lived here at MCK. Later the same evening, Lyn and I were talking about his departure and she wondered out loud if I was the right kind of guy to be doing rescue work because I seem to get so attached to some of the animals. I thought about it for a minute and it occurred to me that if I wasn’t the kind of person who got attached, I wouldn’t be the right kind of person to help either. Back when I was building houses for a living, the raw materials showed up on a truck. The driver pulled the straps off the load and dumped it on the ground and drove away. Then we cut the pieces to length and nailed them together until we had something that looked like a house. Now my “raw materials” arrive in animal crates. They look at me, and then quickly turn their heads in a typical, canine calming-gesture. Sometimes they are shaking with fear. Sometimes their distrust is so profound that I am unable to touch them. The sound of my voice makes them loose control of their bladder. And the tools are different too. In cases of extreme fear we are limited to love, patience, and consistency. Gradually we build trust. Then we begin to communicate and cooperate. Every day, you hand this animal a little hunk of your heart and they give you back the thing that makes you human. Awwww… fer Pete’s sake!! I’m getting all mushy again!! DANG IT! Farewell Diesel! I wish you the best of luck in your new home! You taught me a lot, my friend, maybe more than I taught you! People love to imbue their dogs with human characteristics and stubbornness is one of them. It seems completely harmless on the surface. We have trouble teaching our dog a certain behavior so we just assume they are stubborn because we can’t get their compliance or cooperation. Most of the time when I hear folks say this, I know they’re just being silly, applying a liberal dose of whimsy to a difficult situation. The problems crop up when we say that our dog is stubborn and we begin to actually believe our own silliness. Branding a dog as “stubborn” is tempting at times because it relieves us from the responsibility to modify behavior, “I wish I could get him to stop barking, but he’s just so dang stubborn!” See how that works? There’s a problem with a behavior, nuisance barking. We try to fix it, we are unsuccessful, so it’s the dog’s fault because he’s “stubborn”. There is no such thing as a stubborn dog. There. I said it, knowing full well that I have opened myself up for a bombardment of allegedly stubborn behaviors, many of which I may have insufficient talent to fix. Be that as it may, I will stand by my statement, “there is no such thing as a stubborn dog”. Often, when a client or customer describes their dog as stubborn, I tell them, “There are no stubborn dogs, only unmotivated dogs.” Then we look at the behavior we’re trying to achieve and we start searching for an effective motivation. 1. He must understand what you are asking. 2. He must be physically and mentally capable of the behavior. 3. He must be properly motivated to perform the behavior. Number one is where things most often break down if we fail to gently teach the dog what we want. Number two breaks down when we have unrealistic expectations about our dog’s mental or physical abilities. Number three is the easiest one to miss. I’ve seen traditional trainers use excessive amounts of force trying to motivate and I’ve seen positive trainers using inappropriate rewards in their attempts to motivate their trainees. The possibilities for screw-ups are almost endless! Let me tell you about my screw-up yesterday to illustrate my point. I was running a T-drill with a retriever yesterday morning. He had run the same drill in a different place the day before and he had been running this same drill with varying levels of challenges for quite some time. The T drill is a common retriever training tool in which we place piles of bumpers at the top of a T and at the ends of the arms of the T. Imagine the T as a big letter, written on the ground. It can be just 10 or 20 yards tall for beginning dogs or over 100 yards tall for advanced dogs. We stand at the foot of the T and send our dog in a straight line toward the top. We have the option of stopping him anywhere along the line and sending him, via hand signals, to any one of the 3 piles of bumpers where he is to pick up one bumper and return to us by the shortest route. More often than not, we just send him to the top pile where he picks up a bumper and returns directly to the handler. That way he gets the idea that his main job is to run far and fast unless we say otherwise. Peck was running the drill yesterday and for some reason he was running the route to the back-pile in a big curve. I don’t mind a little variation from a straight line, but I don’t want to see big curves that slow down the return or put the dog in territory that is clearly off the line. One of the main points of this drill is to teach straight lines so we can send a dog on a retrieve without worrying about him wandering into the next county or getting himself into trouble while he’s making a retrieve. So… here’s Peck running out to the pile and making a big curve to the right, then making a big curve at the same spot on his return with the bumper. 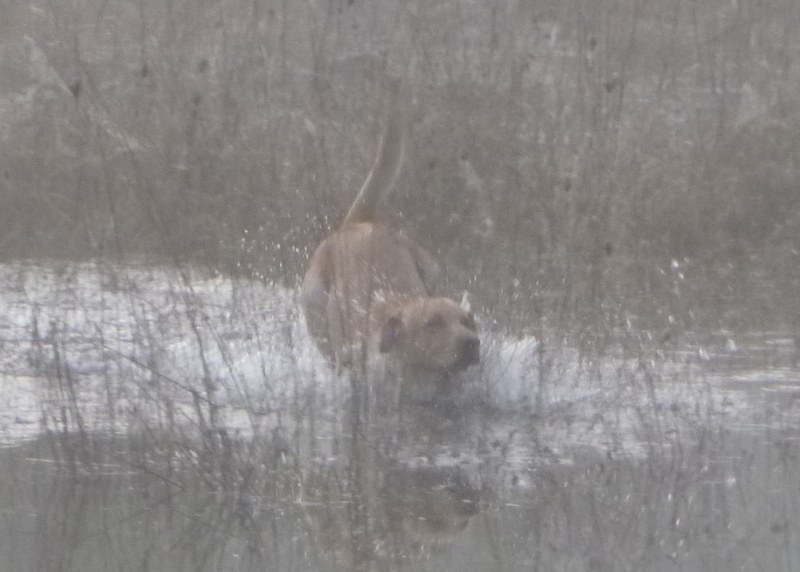 This happened on two retrieves in a row, so I began to put some pressure on him to run straight. I applied this pressure by yelling the command, “BACK” just as he neared the spot where the curve began. Nope… didn’t work. He still ran a curve, out and back! At this point I was getting frustrated because Peck is capable of running this drill perfectly. I was tempted to up the ante and nick him with the e-collar to add more pressure to my BACK command. Fortunately, I recalled my own little sermon about stubbornness. I decided to take a walk and find out what was going on. I sent myself on the same retrieve and took the curvy route that Peck had taken. I paid extra attention to the wind direction to see if there was some scent that was pulling him off the line. Sure enough, there it was, a partially eviscerated rabbit had been abandoned by a predator and the scent was pulling Peck off the straight line. If we think about this scenario in terms of motivation we can see that it was actually amazing that Peck didn’t totally abandon his retrieving and go check out the tasty morsels that were lying there like a bountiful buffet line! 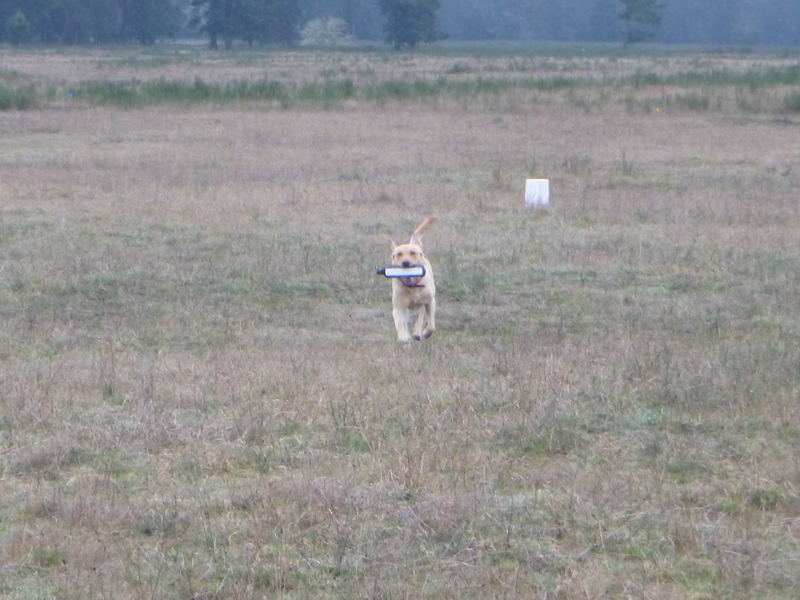 Peck had to decide if he was gonna make a perfect retrieve or if he was going to go have rabbit for breakfast. I shudder to think that I was about to zap my dog for nothing more than obeying his nature. This kind of stuff is going on all around us every second of every day in dog world. There are constant motivators at work. Some of this stuff is really difficult for us humans to even see. So what did I do? Well… I want my dog to be able to work in the face of challenges like this, so I shortened up the lines of the T and continued running the drill. By shortening the lines I was able to increase my influence without resorting to force. We cut the drill down from being about 125 yards to about 50 yards and it made all the difference. Peck didn’t forget about the rabbit, but with me in close proximity he was more motivated to work with precision and less motivated to take a bunny-break. The lesson I’ve taken from this is to look for the hidden motivators behind any behavior I am trying to modify. Every behavior has a consequence and every behavior has a motivator. There is no such thing as a stubborn dog. Zeke, the dobie pup is boarding with us while his guardians are vacationing. 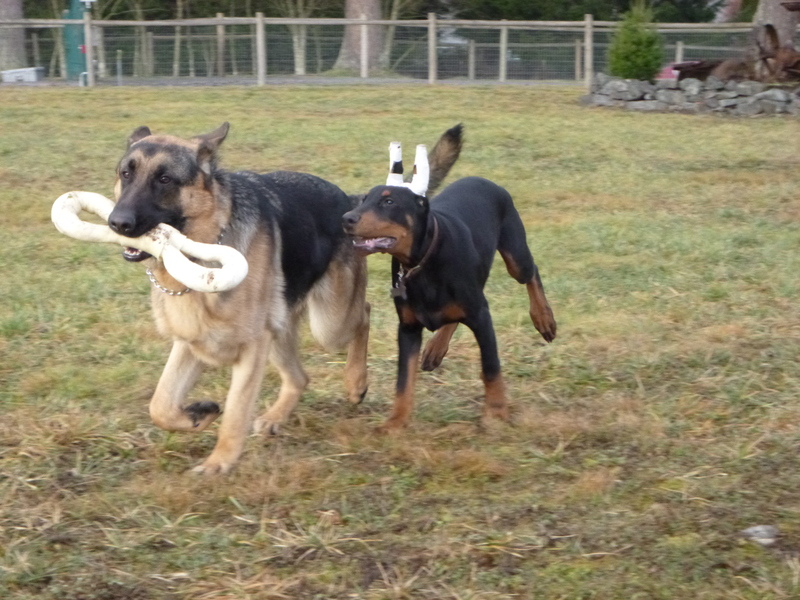 After a couple of days of being kenneled close to each other these guys had to get out for a some romp time together. I introduced them very carefully because they are both young, unaltered males. 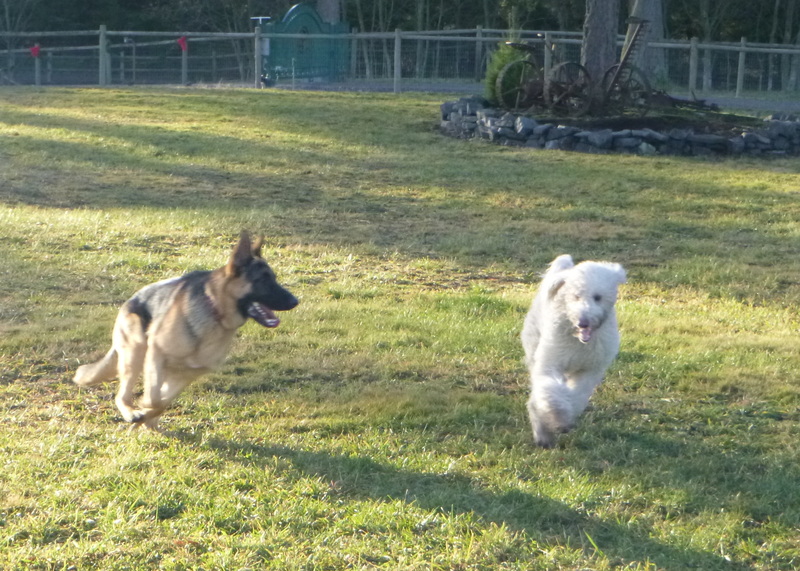 They’re both high energy dogs and it was a blast to watch them together. 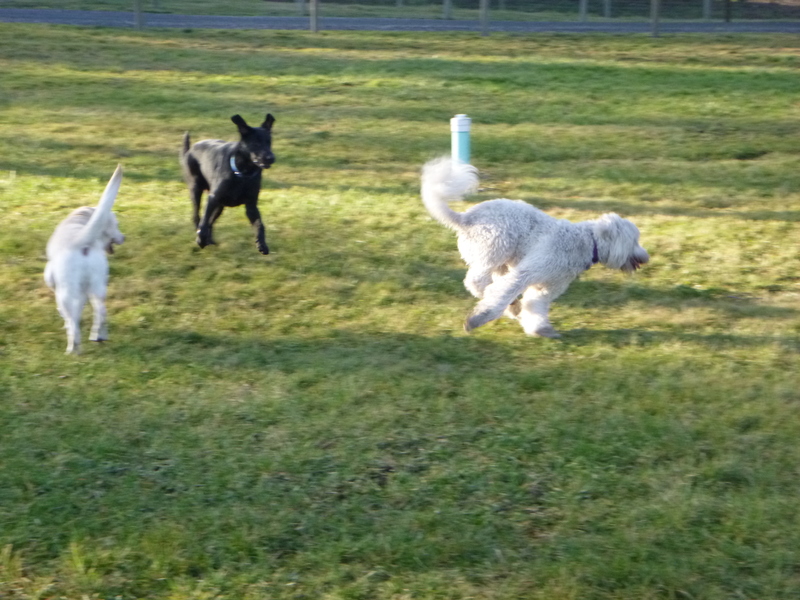 Zeke also enjoyed some romp time with Bailey, who is always the life of the party when she boards with us! Yep, they all love Bailey! She’s not afraid of a little dirt. Bye, Bailey! See you next time! Peck’s Progres… on Got Influence?